Last Fall, my friends Deb, Lisa, and I started a small round robin. We each made a quilt block (or a quilt center) and took turns adding borders to it. 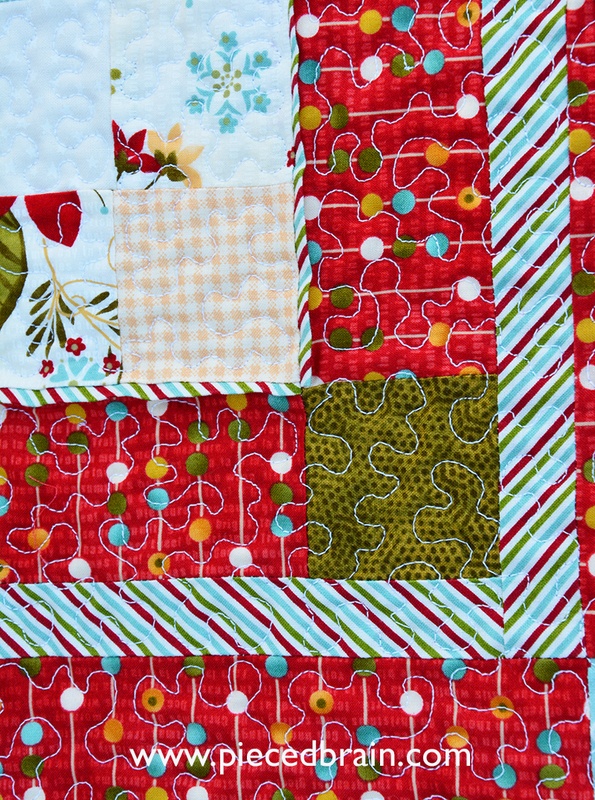 This is how my quilt turned out - don't you love these prints in the Holly's Tree Farm fabric line by Moda Fabrics? (My favorite quilt holder is not around much now that school started, so a bench will have to do...). This square table topper measures 33-1/2". 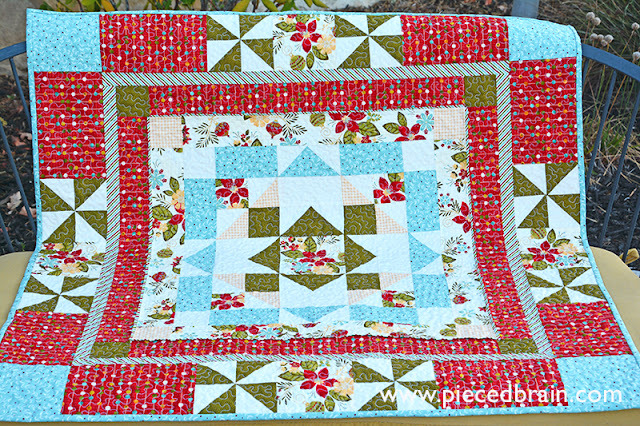 Lisa added the first few borders: blue print with flying geese, cute striped flange, the red and green border and the large striped border. 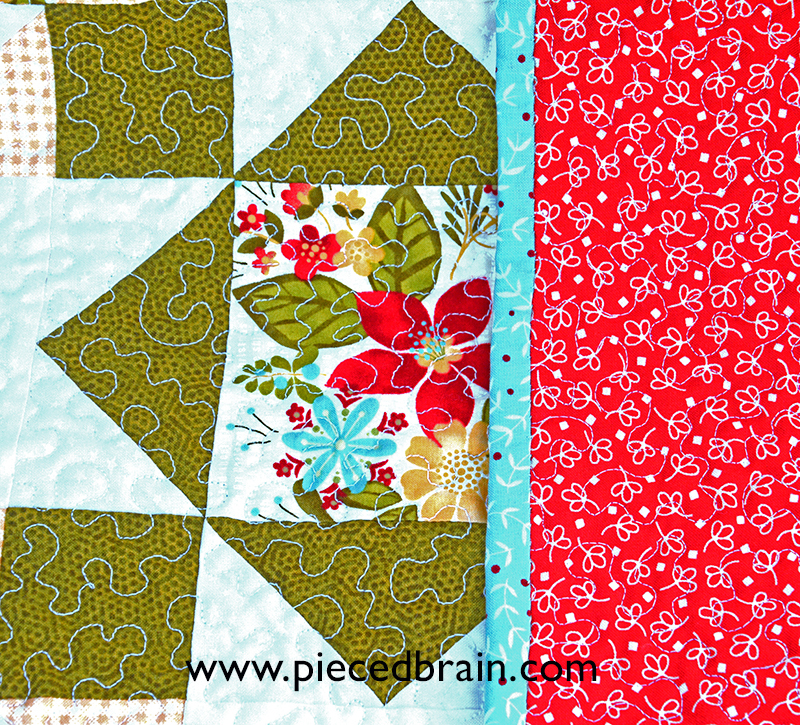 Deb added the large border with pinwheels and corner blocks. 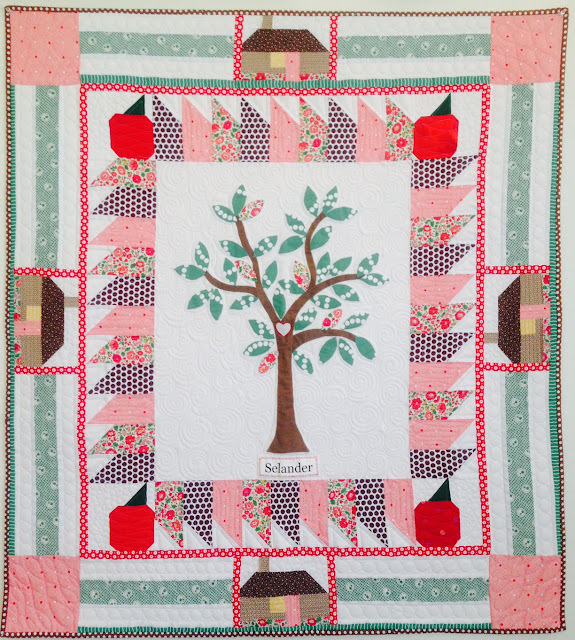 I treasure this quilt! The colors in this picture are sort of funky but I wanted to show you the simple quilting lines, the backing, and the binding up close. 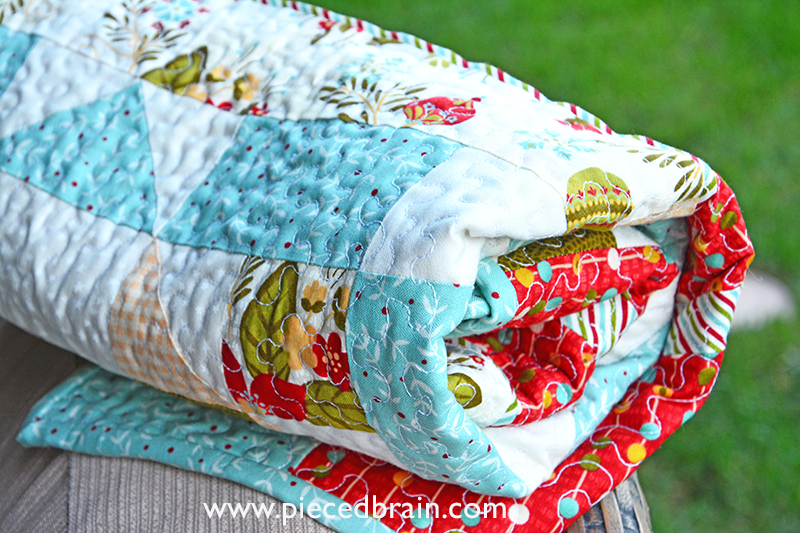 As I quilted I made sure not to touch the flange. It took me a while to finish this project because there was so much going on during the first part of this year. Now that it is ready I can't wait to use Christmas season might come earlier to my house because I need to see these pretty colors on the table! I made the fence border with apples on the corners (yes, the flower print is Liberty of London! ), and Lisa added the last border - I love the houses! 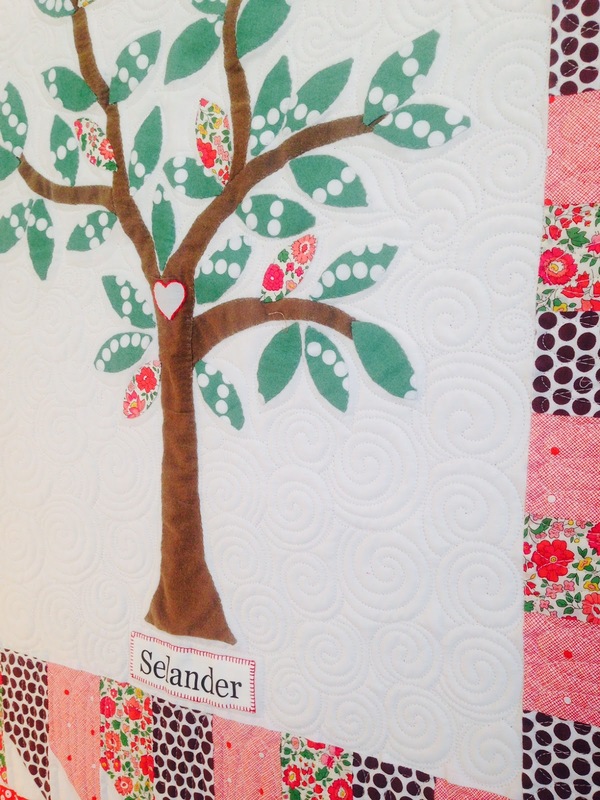 She printed Deb's last name and appliqued it under the tree. Cool way to personalize and add meaning to the quilt. 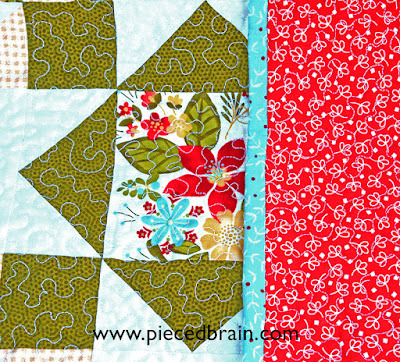 I love the quilting lines and the random print leaves. Actually, I like everything about this wall hanging! I hope this post has inspired you to start your own round robin. You don't have to have a lot of people in your quilt group to do one. As for us, we are going to start another one this Fall. Stay tuned! Round Robins are so fun. Isn't it great to see what is added to them? Wow, so beautiful projects, love them all and your fabric combo caught my eye! !